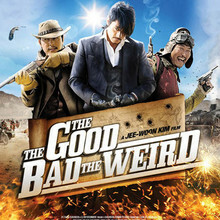 There is lots of undifferentiated action in Kim Jee-woon Kim’s The Good, the Bad, the Weird, a Sergio Leone pastiche with Mad Max overtones. It’s set in the days before World War II, in Japanese-governed Manchuria. Everyone is contending for a treasure map deep in the desert. By “everyone” we include a pack of post-apocalyptic Mongols, maybe the last descendants of Genghis Khan. A straight-shooting, courtly bounty hunter in a cowboy hat played by Jung Woo-sung, is on the lookout for a savage psycho with a peekaboo haircut and black-leather gloves. This bad guy, helpfully named The Bad, is played by Lee Byung-hun. Between this obvious hero and more obvious villain is mortal flesh: The Weird, a sloppy good-for-nothing of a bandit. He’s played by one of the most recognizable and likable Korean movie stars Song Kang-ho, who was the tormented priest in Thirst. This Eastern adaptation of a sweeping Western changes Leone’s focus in one important respect — The Good, the Bad and the Ugly wasn’t so thoroughly about the Eli Wallach character. We follow The Weird with more interest than we do watching the other extremes of virtue and villainy. Parody or pastiche, The Good, the Bad, the Weird gets into slapstick — The Weird uses the two-fingered Moe Howard defense to escape captors. At one point, he slaps on a bullet-repelling deep-sea diving helmet to survive a gunfight. The stunt work is zippy in spots, but the lack of any serious female action, the overlong running time and the prettiness of the flying camera make one miss the golden age of Hong Kong cinema, when efficiency matched the exuberant violence.